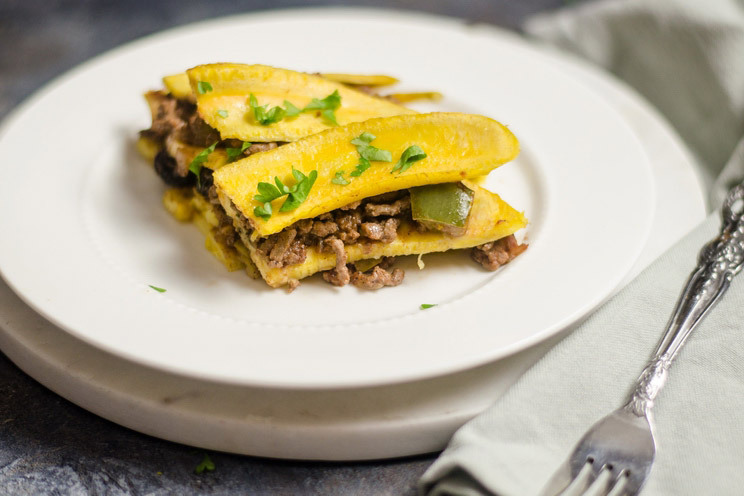 The delicate sweetness of ripe plantains and raisins balances the savory flavors of spiced minced beef in this Paleo Pastelon recipe. Pastelón is a Puerto Rican dish layered like Italian lasagna, with thinly sliced sweet plantains combined with hearty beef and tomato. While the classic version is made with fried plantain slices, this recipe keeps it lighter by boiling them instead! Don’t worry, plantains remain firm after boiling and can be sliced nice and thin for extra layers. Plantains look like bananas, but they are starchier and lower in sugar. Packed with nutrients, they are an excellent source of fiber, potassium, vitamin C and lots of other vitamins. This recipe calls for yellowish-brown plantains, so you may need to wait for a few days for them to ripen up before cooking. To make this Paleo Pastelón, boil the plantains skin-on for about 20 minutes, then peel and cut into thin slices. While the plantains cook, assemble the beef filling by sautéing with garlic, onions, crushed tomatoes, raisins and spices. Assemble the pastelón by arranging a layer of sliced plantains in a greased baking dish, top with half of the beef mix, then another layer of plantain and the other half of the beef mix. Top with a final layer of plantains and bake in the oven about 25 minutes, or until the plantains are golden-brown. Remove from the oven and serve topped with chopped parsley. 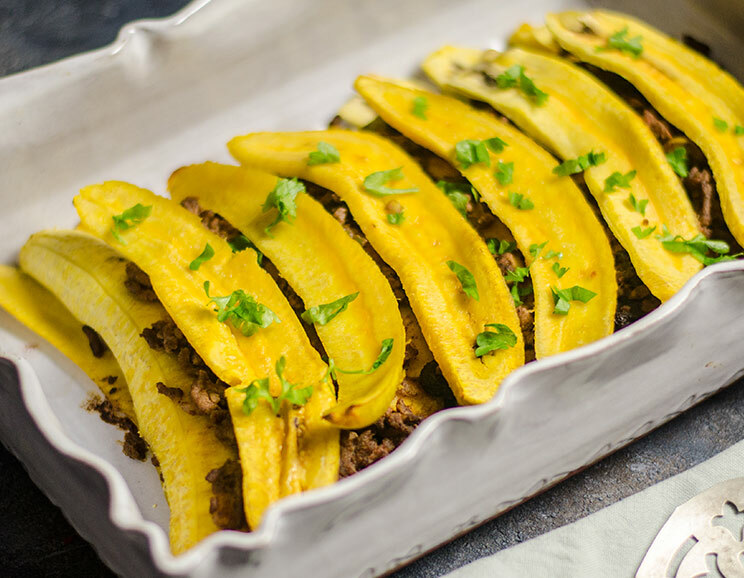 The delicate sweetness of ripe plantains and raisins balances the savory flavors of spiced minced beef in this Paleo Pastelón recipe. Preheat the oven to 350°F. Grease a baking dish with olive oil. Trim the ends of the plantains and place them in a large stock pot filled with salted water. Boil for 20 minutes, until the skin starts to open. Using tongs, carefully remove them and place on a plate to cool. While the plantains are cooking, prepare the filling. Heat the olive oil in a large skillet over medium heat. Add the onion and garlic and sauté until the onions are translucent and the garlic is fragrant, about 2 minutes. Add the ground beef, stirring to time break it down until browned and cooked through, about 7 minutes. Add the raisins, cumin, coriander, salt and pepper, then pour in the crushed tomatoes and water. Stir until mixture is reduced and thickened, about 3-4 minutes. Remove from the heat and set aside. Peel the plantains and cut into thin slices using a mandoline or a sharp chef’s knife. To assemble the pastelón, place a layer of plantains at the bottom of the baking dish, then top with about half the beef mixture. Repeat with a second layer of plantain, then beef, and a final layer of plantain. Bake uncovered for 25-30 minutes, or until the plantains are golden brown. Remove from the oven and serve with chopped parsley. Tip: To save time, just assemble the dish the day before, cover and refrigerate until it’s time to bake.